Uncoated tablets for fever, common cold, flu, acute bronchitis, pneumonia, pharyngitis, otitis media, parotitis, measles, tonsilitis, with symptoms of aversion to wind, headache, thirst, cough, throat pain. 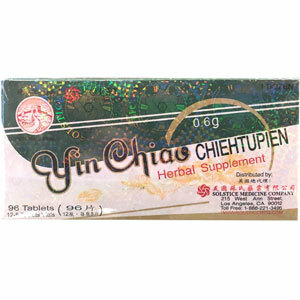 Yin Chiao Chieh Tu Pien supports the health of the mucous membranes of the nose and the throat, as well as the parotid gland. This product also supports the health of the immune system, respiratory system, nervous system and gastrointestinal system. Fever, common cold, flu, acute bronchitis, pneumonia, pharyngitis, otitis media, parotitis, measles, tonsillitis, with symptoms of aversion to wind, headache, thirst, cough, throat pain.